The fishing for dolphin off of key largo has slowed a bit this month. We are still finding nice fish when the weed lines are formed and there are pieces of debris floating around. These fish are averaging 10lbs. with some fish over 20. As fall approaches and the mahi fishing continues to wind down we will shift gears to the tuna bite which is really heating up on the Islamorada hump. These Blackfin tunas averaging 5 to 10 lbs. are alot of fun to catch using the light 20lb. spinning tackle. One method we use is trolling with small feathers using the spinning tackle. There are some days that we can load up with plenty of live pilchards. We chum up the tuna right behind the boat with the live bait and cast a live bait right in the middle of the school. This is alot of fun and provides awesome action watching the tunas blow up on the live bait right behind the boat. The Swordfishing has been excellent all summer long. Every charter we have had this summer was successful averaging one fish per trip. A good trip is my combo trips when we leave the dock around 2:00 in the afternoon and fish for mahi or tuna until it gets dark and then put our Swordfish lines out in the evening. 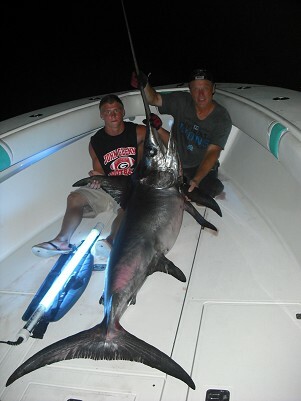 We can fish five baits for Swordfish using squid or live blue runners. We recently took Jeff Kuhary and his son Jeff from michigan out on a combo trip. We only found one school of mahi while we were trolling out but they were nice fish. We caught 10 of them averaging 7 to 12 lbs. As we set up our Swordfish baits that night we had an instant bite. After hooking the fish we fought it for app. 20 minutes before losing the fish. Once we reeled up our line we realized we had a shark after noticing the hook was cut off because of sharp teeth. It wasnt long after that we hooked another fish. This one seemed big as it dumped off 300 yards of line in a matter of seconds. After an hour of battling the fish we realized this was a big fish. Another 3 hours later we had a real nice Swordfish at the side of the boat. The fish weighed 250lbs. We should see some good Swordfishing through the fall while the weather stays calm until the winter when it is windier making it harder to get out there.